New York Estate Lawyer Albert Goodwin, Esq. How do I make sure the court is not going to void my will? Should I make a trust? How do I plan for a disabled child? How do I plan for my own disability? We help clients legally qualify for certain types of Medicaid through the use of trusts and other advanced Medicaid Planning techniques. The trusts help our clients qualify for Medicaid as well as achieve other benefits such as avoiding probate and keeping the inheritance in the immediate family. Do I qualify for New York Medicaid? Being an executor can feel like there's a target on your back. Albert Goodwin is a New York estate lawyer who can help you get your peace of mind back. Are the beneficiaries accusing you of cheating them? Are they challenging the will? Estate lawyer NYC - we can help you fight back. Albert Goodwin, Esq. is a New York guardianship lawyer who can help you establish a guardianship for a loved one or defend against a guardianship that you feel is being forced on your loved one. Our law firm has helped hundreds of people achieve great results in their case. We've secured millions of dollars for our clients. We know New York City Surrogate's Courts and we use our knowledge and experience to your advantage. Albert Goodwin is an experienced New York estate lawyer who has successfully represented clients all over NYC. 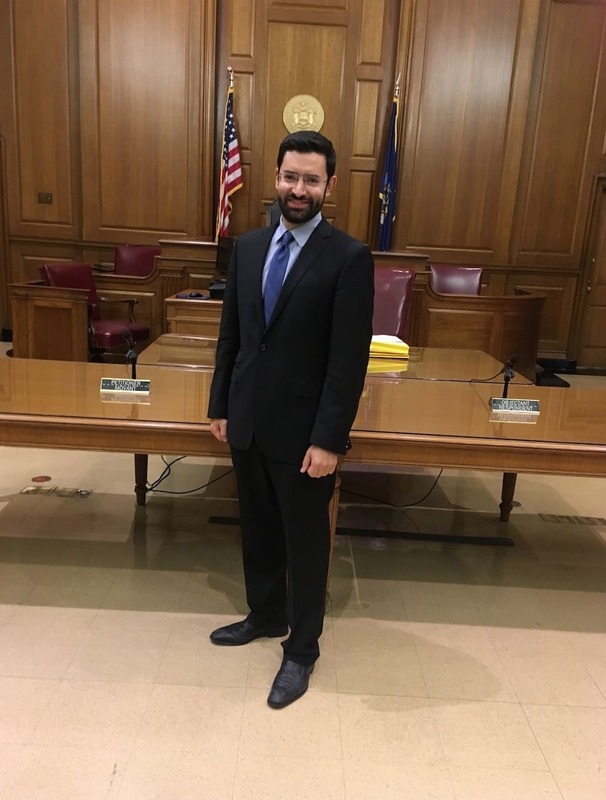 He is your local estate lawyer near me - he has experience in all parts of the city and beyond, including New York County (Manhattan), Kings County (Brooklyn), Bronx County, Queens County, and Richmond County (Staten Island). He has also successfully litigated estates in Nassau County and Suffolk County in Long Island, as well as in Westchester County (the White Plains court). Resources for New York Estate Attorneys - If you are a New York City estate attorney who is looking for a specific form or for guidance in representing a client in an estate case, you may be able to find it here. We are also available as co-counsel and are ready to step in as trial lawyer on short notice if necessary. Read our articles (PDF) here: Will Contests in New York: An Overview (PDF) and Three Crucial Steps in New York City Estate Planning. If you are looking for a New York City estate attorney, contact Albert Goodwin, Esq. Give us a call at (212) 233-1233. We look forward to securing your estate for generations to come. by Russell Kivatisky, Ph.D. on New York City Estate Lawyer Albert Goodwin, Esq. During a long, drawn-out estate settlement, I was very fortunate to have Albert Goodwin as my attorney. He is extremely competent, straightforward, and very effective. Albert was my confidant and legal guide as he tackled my case. I always felt that he was looking out for my interests and giving me sound advice. Prior to Albert's involvement, my case had come to a halt. He moved it along and brought it to a satisfying conclusion. I attribute my eventual success solely to Albert's actions. I greatly appreciate all that he did for me. Russell Kivatisky, Ph.D.
by Mrs. Michele Hines Diaconescu. on New York City Estate Lawyer Albert Goodwin, Esq. My husband died in Australia on a scuba diving vacation that turned out to be to much for his heart, leaving a substantial estate. Before I was aware of what was going on his sister rushed in naming herself next of kin, claiming that her brother was divorced attempting to cheat me out of my inheritance. I was devastated at the loss of my a strained yet very loved husband. I spoke to some attorneys in the state of North Carolina where I reside however I was informed that they were unable to take the case as my husband's estate was in New York, therefore I would have to acquire a New York attorney. I went on the internet and just prayed that the lord would bless me with a good attorney, I was blessed with not just a good attorney but a great one. A tearful frantic call to a busy Albert Goodwin, who to my surprise answered his phone, after all it was after hours but this man was still there, upon hearing my situation told me he would move some things around and would be happy to take my case, I think he disliked the way I was being treated. This is a great firm they helped me every step of the way even though I lived out of state. Mr. Goodwin took control of this situation we became a team, he requested documents once he had those documents my worries were over, soon I was executive of my husbands estate executing his wishes as I know he would have wanted. I will never forget Mr. Goodwin's last words to some people we will not name, "After All She Is His Wife"
by Valerie Kahn on New York City Estate Lawyer Albert Goodwin, Esq. He took a case that another lawyer refused to take and got us a settlement. Very happy with his abilities as a lawyer. by Lawrence Alexander on New York City Estate Lawyer Albert Goodwin, Esq. Mr. Albert Goodwin, Esq., represented me as the beneficiary of a trust. This very complicated & difficult issue had been unresolved for 24 years! I finally received my rightful share, only after Mr. Goodwin used his intelligence, observational skills & foresight to win. He has excellent morality...something sadly missing in most people in the 21st Century. I am thankful & grateful I hired Mr. Goodwin as my attorney. He went above & beyond to win. I highly recommend his services. by Howard Tom on New York City Estate Lawyer Albert Goodwin, Esq. Mr. Albert Goodwin, Esq. does your legal matters correctly the first time. He does his legal work in a very effective and sensitive way. In my case the legal work was for a will, health care proxy and power of attorney. He has become the go-to-man for me to find an appropriate lawyer- an additional great benefit of our professional relationship. I recommend Mr. Albert Goodwin, Esquire highly.